Tabitha has five kittens; two boys and three girls. The kittens are chocolate point and chocolate tabby point Siamese. All kittens have found new homes. Please click on the photo to go to Tabitha's kitten diary. All kittens have now found new homes. Emunah has four kittens; three boys and a girl. 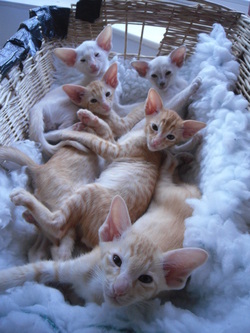 All kittens are red point Siamese. 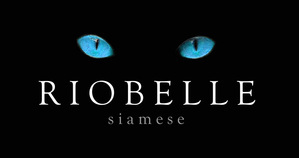 We are particularly excited about this litter as it is a repeat mating of the litter from which we had Riobelle Northern Lights and Riobelle Amorosa. Please click on the photo to go to their kitten diary. Click on the photo to go straight to their kitten diary. 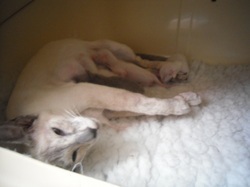 We had seven kittens born on 14th February 2012. All kittens have now gone to their new homes. 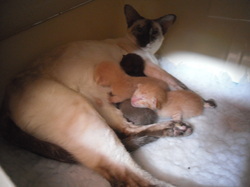 Four kittens born 6th August 2011. 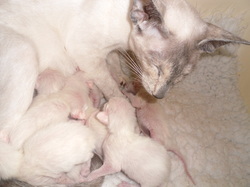 All kittens will be red point Siamese (32a) from this mating. All kittens have gone to their new homes. 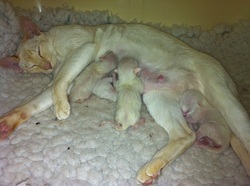 We are delighted to welcome the arrival of Belle's kittens born in the early hours of 21st May 2011. To meet her six kittens please click on the photo on the left to go to their kitten diary. 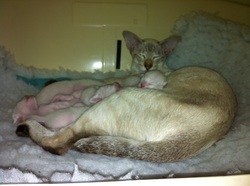 We are delighted to announce that Katy gave birth to four healthy Oriental kittens on 13th April. To meet the kittens please click on the picture on the left to go to their kitten diary. Emunah has given birth to seven kittens sired by Gr Ch Fiordiliso Cuba. They will be ready for their new homes at the end of May. Please click on the picture on the left to meet the kittens and follow their kitten diary. All Emunah's kittens have found homes now and we are taking no more enquiries for this litter.